From a rather lovely post by Rachel Hills about how ‘muses’ and ‘it girls’ and ‘hunks’ are given much of their ‘certain something’ that becomes their trademark via being lovingly presented by creative people who happen to adore them: the most flattering lens at the most aesthetically appealing angles documenting the most entertaining anecdotes for the most beguiling vignettes. She asks how we might all benefit from having that loving focus on our most attractive and fascinating attributes, and why not find ways to ‘bring out the magic’ in more of the people we know? A narrative is determined as much by what is omitted as by what is included. I’m taking a different, more broadly political and obstreperous tack: what are the narratives you keep on coming across which gobsmack you repeatedly by the unacknowledged omissions? The one that’s gobsmacking me lately is the failure to acknowledge how power imbalances interfere with classical economic models of scarcity in certain situations, largely because such models persist as treating people as commodities, as highlighted by Echidne of the Snakes in this post on the allegedly impending end of the one-child policy in China. Classical economics tells us that since women are scarce in China, this means that they will have more choice and power, more autonomy, in determining who they partner with, and that this will be a great advantage to them. What the actual facts tell us is that as women become more scarce in China that they are even more commoditised both by their own families and by strangers who would kidnap them in order to traffic them to men who otherwise would not be able to find themselves wives. It is not the women themselves who gain greater autonomy through their scarcity value – it is the others who ‘own’ them who profit. I’m sure you can think of other examples where the classic models applied to commodities fall down in a heap when people attempt to apply them to social interactions. Because people are not commodities, and this is one of the greatest omissions in the narrative of economics. 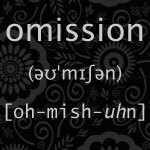 Non-sequitur: while googling for an image expressive of “omission” (which I didn’t find) I found an entertaining dose of woo instead. Just a reminder of what’s out there in terms of weird narratives. Tis true! Doing econ 101 at the moment and that is a striking feature. In US I’m finding that facts or events that take place outside the US are omitted from the main narratives about politics and the economy. what are the narratives you keep on coming across which gobsmack you repeatedly by the unacknowledged omissions? I just thought of one. In my course we do everything in groups. I always try to make our characters a little more representative; have a character use a cane or wheelchair, or give them a gay backstory, or have a character of colour, or just have a male and female option. Every time, no one else can see why it’s important, and argue that young straight white males are just as representative, and have the most universal appeal. The omission is that every option is just as weird as any other, but only a highly specific combination is considered normal.